At MediaHeads we like to cut out the nonsense and jump straight to the real talk. So if you’re a new business, or an old enterprise looking for a re-boot, we offer bespoke services and strategies that will get you onto the steady track to success. By establishing where you are now, we can project into the future where you will be and help you reach those all-important milestones. Whether you are looking to improve your website’s visual appeal, get your website to achieve its true search engine optimisation potential or wish to get a higher followship on your social media profiles, we are here to help. MediaHeads are chameleons. We adapt to the world around us and find what works for our clients. As a digital marketing and design agency foremost, we like to dabble in whatever we can because we know it’s not a case for a one-size-fits-all for all our clients. Your business needs a well fitted, tailored package. We know real variety is the spice of life, so choose us to help you put some flavour into your business. We’ve broken down the fundamentals of a business into four elements; Online, Offline, Design and Mobile marketing. This is so each piece of marketing excellence can be given its due consideration. The separate pieces of your package will then be pulled together to fit like a jigsaw to reveal the carefully illustrated masterpiece of your business’ new front. 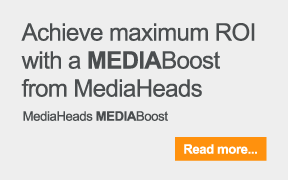 MediaHeads is a Staffordshire based business that specialises in design and marketing. We have a team of marketing experts who we attribute all of our client’s success to. We offer the conventional and the less-conventional, making us able to offer a unique package of creativity and marketing excellence. If you have a business idea or wish to discuss improvements on your business, call us today on 03333 44 77 55. You can arrange a visit to our local office in Newcastle-under-Lyme or alternatively email us at enquiries@mediaheads.co.uk. You can inform us with your ideas and we’ll get back to you promptly.